Whose kids work themselves into a snit when their lunch foods commingle? I get where they’re coming from. As a young lass, I’d freak out upon opening my lunchbox and discovering that my fruit had slid into a pile of chicken. I think we can all agree that strawberries shouldn’t taste like salty bird. Luckily, we’ve got a couple of LunchBots Trio containers on hand for our persnickety kids. 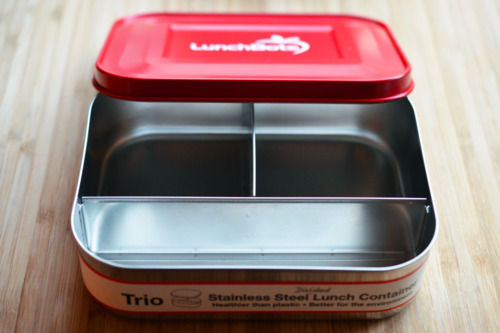 The dividers in these sleek, sturdy stainless steel containers make it incredibly easy to throw together bento-like boxes for the little ones. Plus, they remind me to add some variety into the kids’ lunches. I like to fill the two large square compartments with equal portions of protein and veggies, and to save the treats for the longer, narrower section – though all three compartments are actually the same size, so I guess I’m just fooling myself. 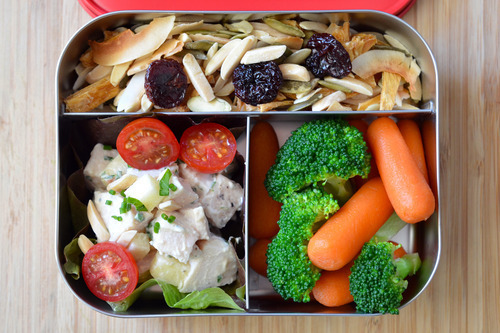 Tuesday’s Lunch: Simple Chicken Salad, Blanched Carrots and Broccoli, Paleo Trail Mix, and Flavored Mayonnaise. 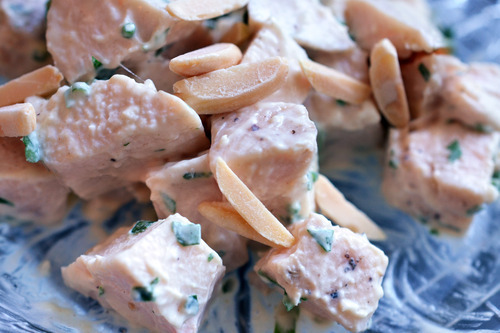 Chicken salad is super-simple to assemble and extremely versatile. Season with salt and pepper to taste, and if your kiddos don’t mind green specks dotting their food, toss in some minced herbs like chives or Italian parsley. Once the dressing’s ready, add cubed leftover chicken (cooked, of course). My Recipe Index offers a bunch of ways to make chicken, including Julia Child’s Classic Roast Chicken and Slow Cooker Roast Chicken and Gravy. In a pinch, the ready-to-eat rotisserie chicken from the grocery store is fine. (I do it all the time. Shhh – don’t tell anyone.) If you’re feeling fancy, add finely diced apples and toasted slivered almonds, too. You can either whip up a batch of your own Paleo Trail Mix or grab a handful of your favorite purchased one. The Double-Os are fond of dried Bing cherries, so I toss a few on top as well. Raw veggies are a quick way to round out the meal. My picky kids, however, aren’t fans of the raw stuff, so I blanch ‘em ahead of time and store them in the fridge. Simply bring a large pot of salted water to a boil, dunk in the vegetables for about 30 seconds, fish ’em out (not with your fingers), and chill the veggies in an ice bath. Blanching the vegetables doesn’t just make ’em more tender – it also makes the colors pop. If you’ve got a bag of desiccated baby carrots at the bottom of your crisper, blanch ’em and no one’ll be the wiser. 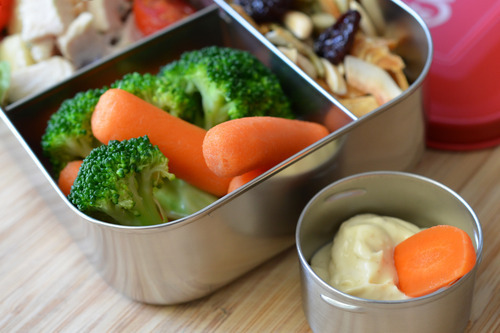 Crudités are always better slathered in a creamy dip, so I spoon flavored mayonnaise, homemade guacamole, or Asian Almond Salad Dressing into a LunchBots Dips container. 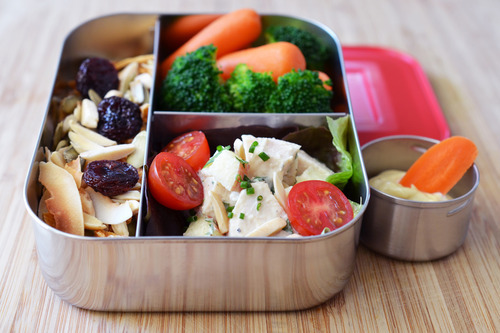 Remember, packed lunches aren’t just for kids, so feel free to go crazy with the Paleo condiments! 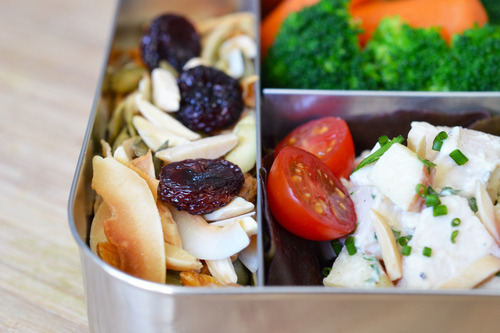 One last tip: You can make and pack everything into a LunchBots container the night before school and stick it in the fridge. 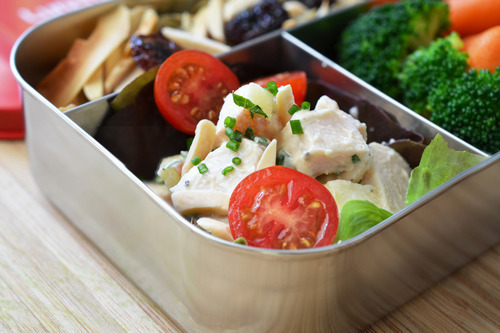 The chilled stainless steel container (supplemented with a reusable ice pack if you so desire) should keep the food cold in your kid’s bag until lunchtime. Don’t forget to check out Monday’s lunch and stay tuned for the rest of the week’s schoolyard eats!